The first London Routemaster (RM1) came into service on 8 February 1956. Routemasters remained in full-time service until December 9 2005, showing incredible longevity on London’s busy streets. 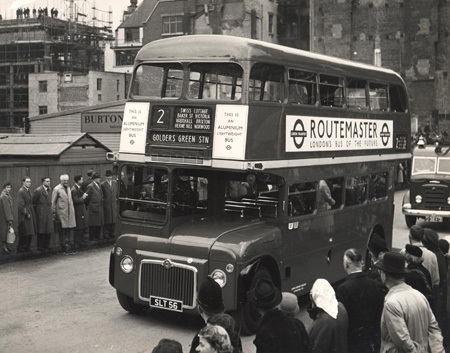 The Routemaster was conceived as an idea in October 1947, just five months after the first post-war RT buses went into service. The vehicle that emerged from the extensive design process would become a vital part of the capital’s identity. The design team, headed by Arthur (‘Bill’) Durrant, set out to design a low maintenance bus with performance as good as a private car. The stylish bodywork was designed by Douglas Scott, a freelance industrial designer who had previously worked on one of London Transport’s RF types. Constructed from a lightweight aluminium alloy, following the successful use of the material for aircraft during the Second World War, the metal body frame and stressed skin eliminated the need for a conventional chassis. As well as the bodywork, Scott gave the Routemaster a distinctive moquette fabric design. Matching the colour of the interior, the vivid design remained inviting whether in broad daylight or under the evening tungsten lighting. The first of four Routemaster prototypes was originally unveiled at the Earl’s Court Commercial Vehicle Show in September 1954. On a snowy February 8 two years later RM1 entered service on route 2 from Golders Green to Crystal Palace. Passenger response was generally positive, with some complaints about spongy seats and unfamiliar noises. A number of alterations were made, including an entirely new engine, and the Routemaster went into full production in 1959. The Routemaster soon became synonymous with London and it developed into an international icon. Today a fleet of heritage Routemasters ensure their presence has not been entirely removed. Transport for London’s New Routemaster is being gradually introduced onto London’s streets, bringing back the open rear entrance of the original Routemaster and continuing the design heritage of its predecessor.